One of my favorite Mexican dishes is pork carnitas. 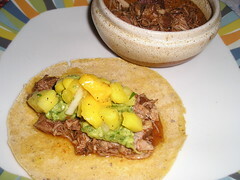 These “little bits” of cooked pork are delicious folded into a warm corn tortilla. Ideally, cubes of pork are slow roasted so that they’re tender inside and a little crispy on the exterior. 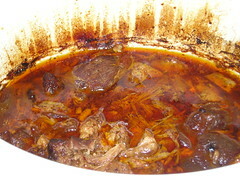 But, lazy me, I just throw hunks of pork shoulder in my slow cooker (*which is not the “real” Crock-Pot brand), add a little water-or sometimes beer-plus plenty of pure New Mexico Chile powder and other spices (garlic, cumin, salt, pepper, a pinch of oregano). The results, a few hours later, are delicious. New Mexican chile powder is not fiercely hot at all, but just has a nice robust spiciness. This does throw off some fat, so be prepared to use a bulb baster to get rid of some of it before serving, or make it ahead, chill, and then easily lift off the fat that rises to the top and solidifies. Of course, you could use flour tortillas, but I really prefer the corn here. This is a great meal, really one of my favorite dishes, from any culture!